Tokaj Hegyalja Piac - local artisan market: It's February - it must be Furmint! It's February - it must be Furmint! Well, what a great idea Furmint February is! So we thought we'd continue the tradition of our special Furmint February wine tastings. Just as we did last year. But this year with some new faces! And some i'm particularly excited to see. As well as one I have to admit I've not heard off. Fantastic. I love László Alkonyi's experience of the wines of the region. And the fact he shares his knowledge - and the wines - with us. It's always an inspiring time. In the Tokaj Wine Region it is particularly revered for its supreme ability to reflect the sometimes unbelievably varied dűlő, each of which has its own unique terroir notes. This modest variety is also an integral foundation of most of the Tokaji Aszú wines - bt ore about that another day. FF is primarily a celebration of the dry Furmint. 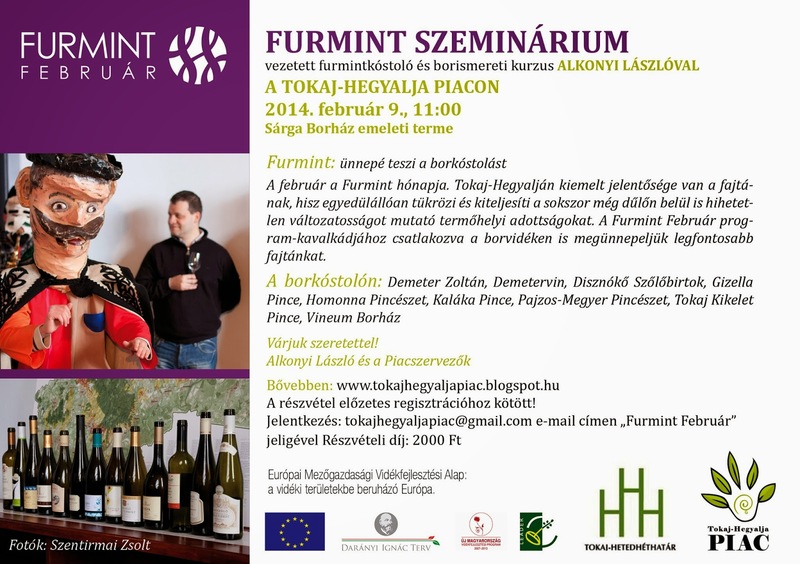 Please reserve your place at the Furmint Seminar at 11am in the function room above the Sárga Borház Restaurant by email tokajhegyaljapiac.blogspot.hu - with subject "Furmint Február"
Hope to see you on Sunday 9th - only a week before the market reconvenes for 2014! Programme for the market in the next post!